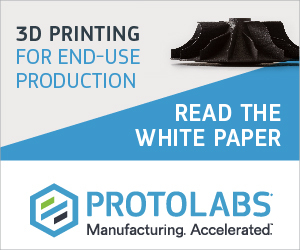 3D Printing Industry took a morning run through what is set to be a record breaking event. 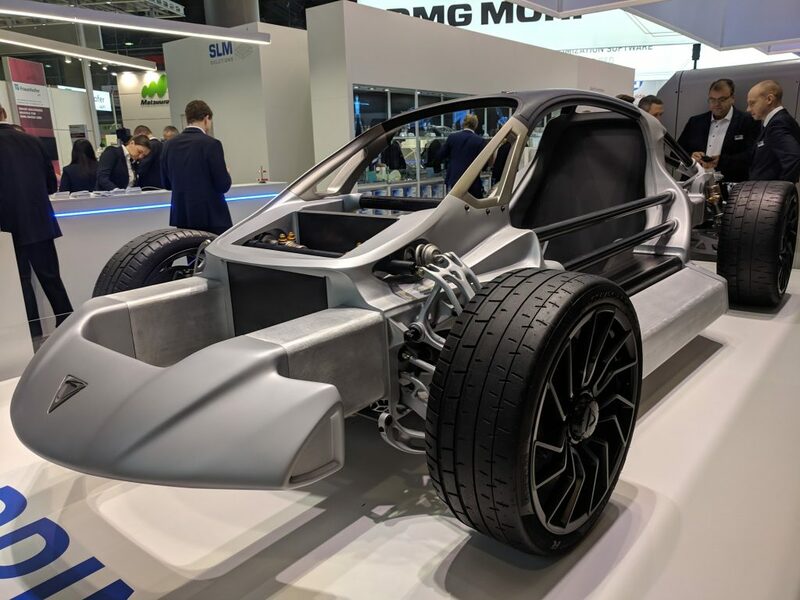 Here are some of our first impressions of Formnext 2018. 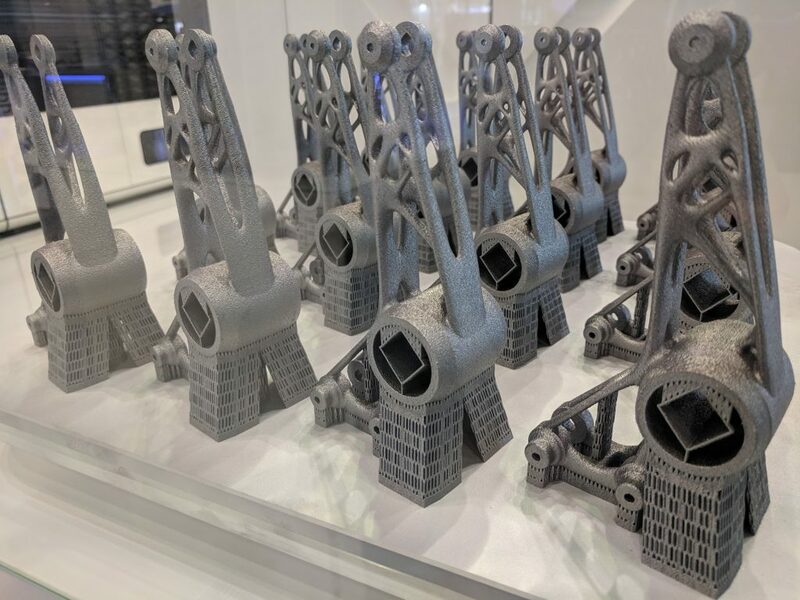 Our team will be in Frankfurt all week to bring you detailed coverage of the 4th edition of what has become the main event on a crowded additive manufacturing calendar – for now here is a brief first look. Industrialization is evident as soon as you step into hall 3.0 on the ground floor of messe Frankfurt. 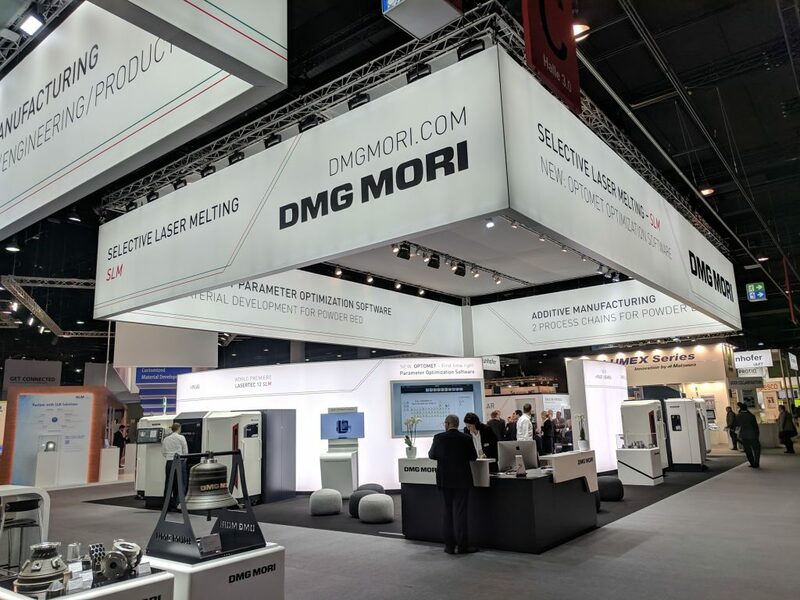 The vast white booth of DMG Mori greets visitors with the Lasertec 65 hybrid system on the left and the world premiere of the Lasertec 12 SLM taking center stage. 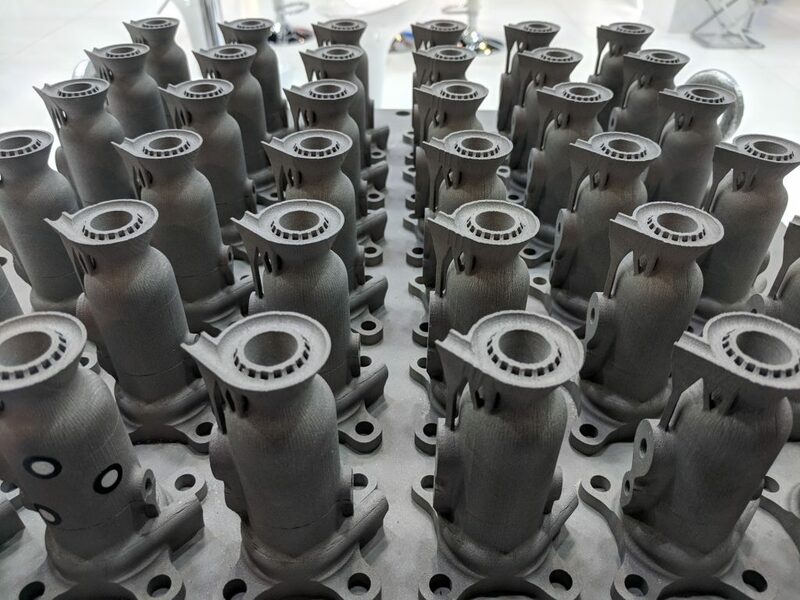 The 2020s may be the decade of additive manufacturing, according to the DMG Mori President, but this company is not waiting. 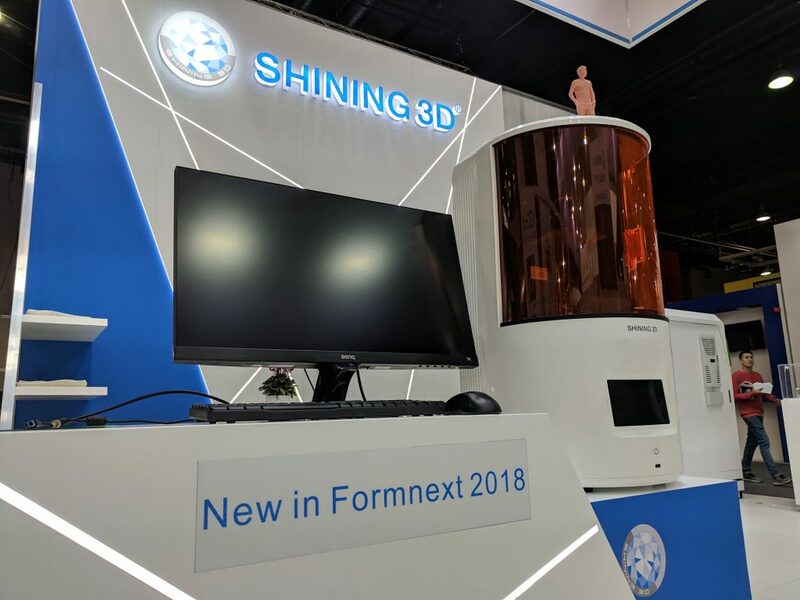 DMG Mori at Formnext 2018. Photo by Michael Petch. Before moving into further into the hall, make sure not to miss one of the more novel AM technologies at this year’s show. 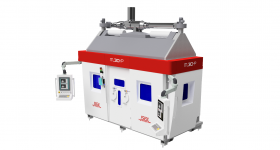 Speed3D has returned with their coldspray AM system. This year the Australian company will be running live demos twice a day, at 11AM and 2PM. The novel conveyor belt FDM system from Blackbelt 3D is tucked away in the corner at booth A88. Also on display here is a Stacker FDM 3D printer with 4 extruders. A much larger conveyor belt 3D printing system from Triditive called the AMCELL can be found in hall 3 at A28. 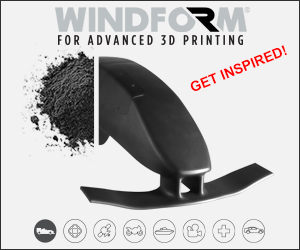 SLM Solutions is launching new software and has the Divergent3D Blade 3D printed vehicle. A strategic partnership between the two companies aims to “transform automotive processes”. The Divergent3D Blade at SLM Solutions booth. Photo by Michael Petch. 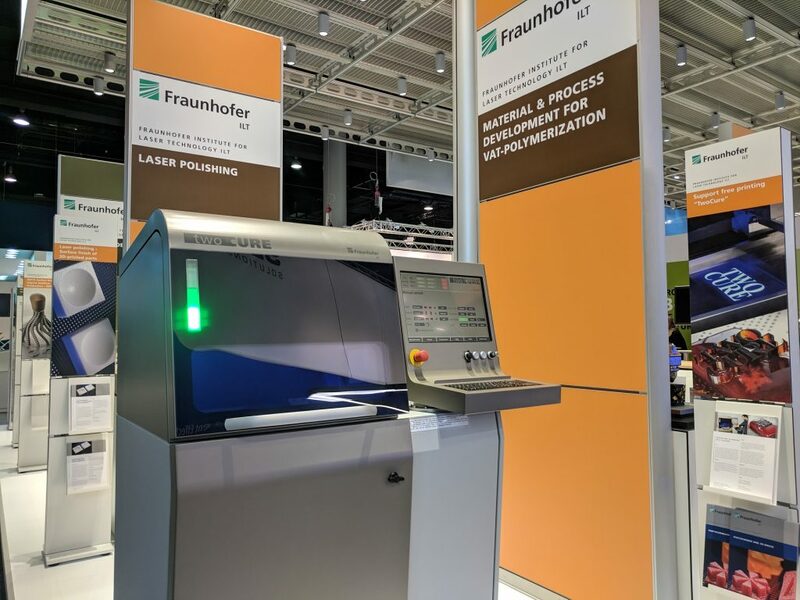 Fraunhofer ILT has an early version of the long awaited TwoCURE system. 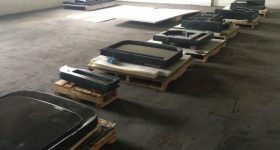 Large quantities of individual components can be produced using this resin based process. Fraunhofer ILT TwoCURE 3D printer. Photo by Michael Petch. Trumpf is extolling visitors to “Get Connected”, another example of how the large machine making enterprises envision AM as operating within existing industrial systems. Systems on display include the TruPrint 1000 and TruPrint 5000. 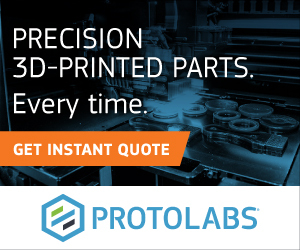 The later metal AM system is intended as a “highly productive and automated” 3D printing system. 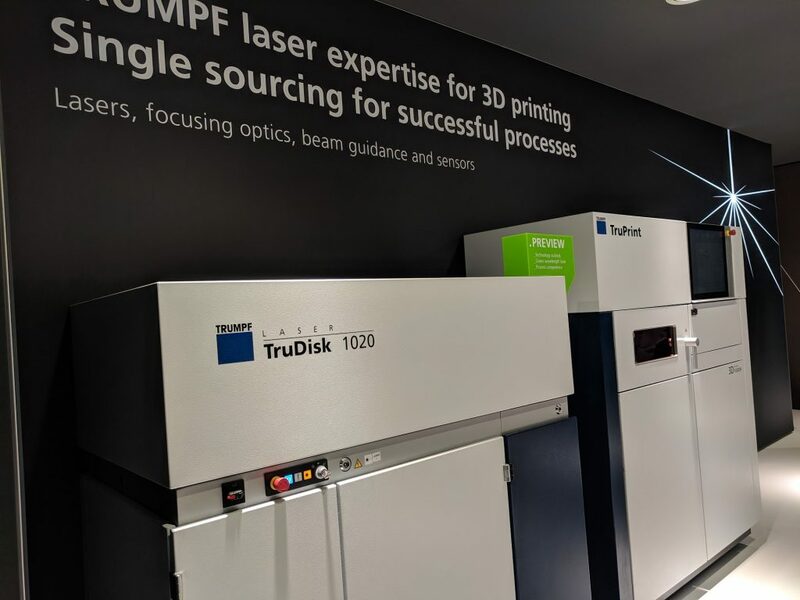 At a press event this morning Trumpf highlighted the 1KW green wavelength laser system that allows 3D printing with materials such as gold and copper. 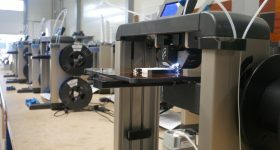 Trumpf green laser technology for 3D printing gold and copper. Photo by Michael Petch. 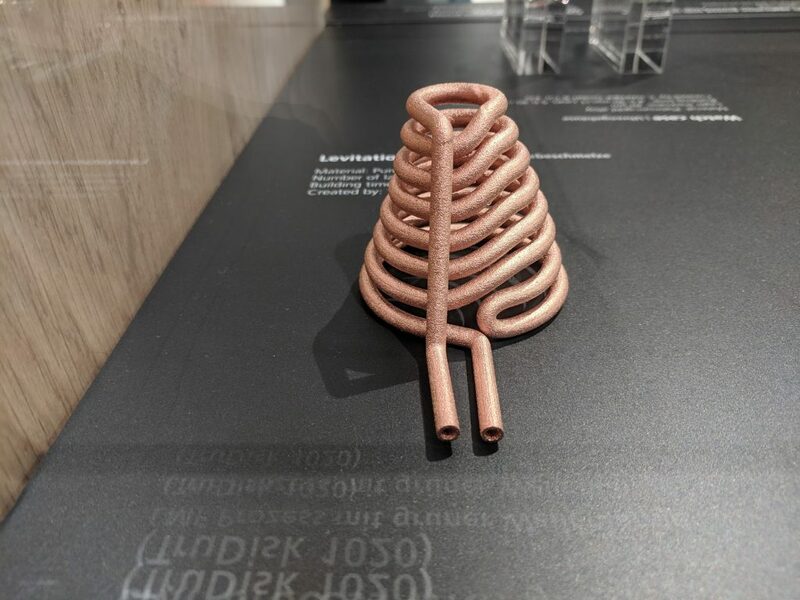 A copper 3D print from Trumpf. Photo by Michael Petch. Booths, build volumes and AM systems all seem to be getting bigger this year. The Siemens multi-level stand features applications including the Bugatti Chiron vehicle aerodynamics control system. 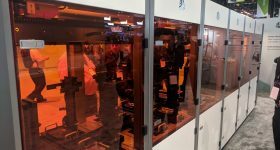 While Additive Industries has the modular MetalFAB1, a metal 3D printing solution that almost spans the length of their booth. 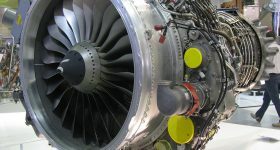 Metal 3D prints from Additive Industries. Photo by Michael Petch. 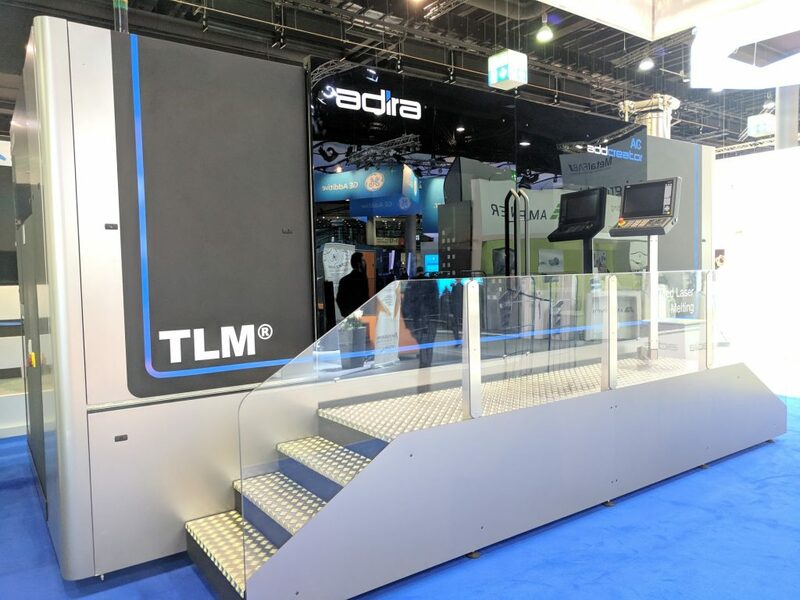 Returning for their second time at Formnext, Adira’s addcreator offers Tiled Laser Melting from the Portuguese company. I’m assured by the company that the latest model still has the same footprint, although it takes me by surprise. The Adira addcreator. Photo by Michael Petch. Too large even for the largest AM show on earth, Titomic has not brought their massive system. However, a display model shows how gantry mounted Kuka robot arms form part of a vision of industrial scale additive manufacturing. 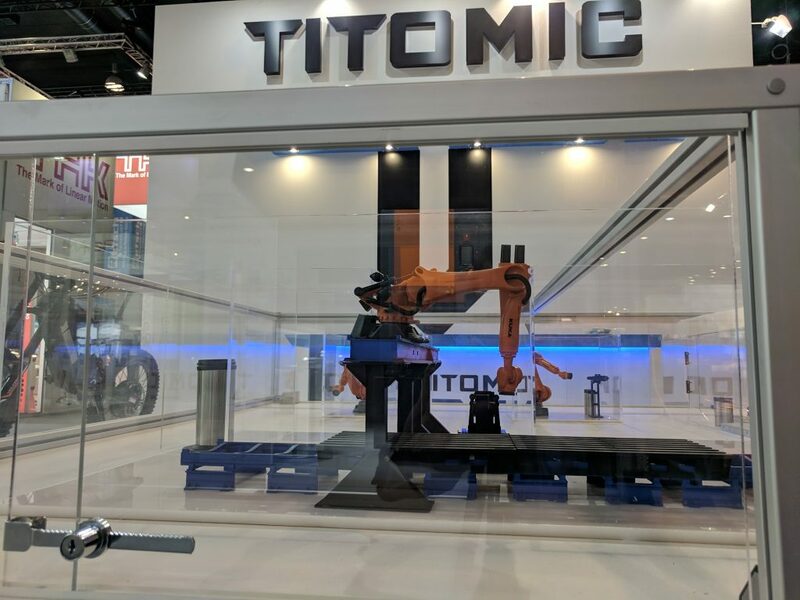 Titomic at Formnext 2018. Photo by Michael Petch. GE Additive invite visitors to “turn your factory into an Amazing factory.” An immersive VR experience is also available for visitors to explore. Metal 3D printing is at the front of the Shining 3D booth this year. Possibly a surprise for those who did not appreciate the extent of Shining 3D’s endeavours. The Chinese company’s Accufab-D1 dental printer is also new for the show. The Shining 3D Accufab-D1 dental printer. Photo by Michael Petch. 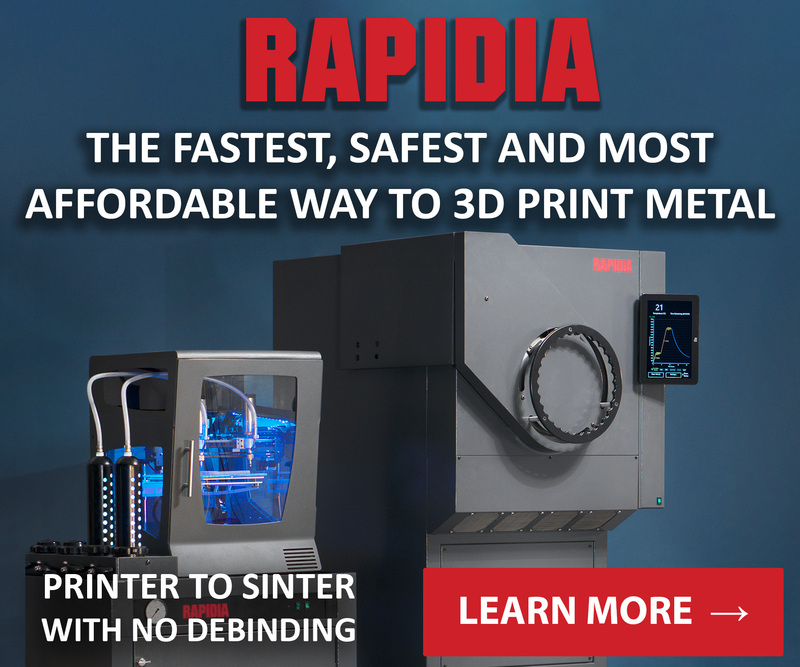 Metal 3D printing from Shining 3D. Photo by Michael Petch. Moving upstairs to Hall 3.1 XJETs booth is fittingly impressive for a company with such a pedigree of developing frontier technology. 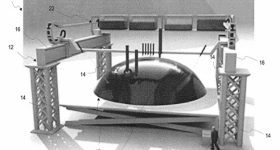 The booth somewhat resembles an asteroid, and the metal and ceramic materials used by the Carmel are equally impressive. Oerlikon AM is highlighting its position as a globally integrated AM service provider with 7 sites across the world. 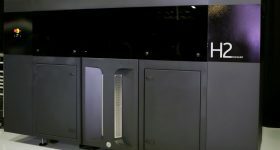 The company offers component production with systems from Arcam, Carbon, Concept Laser, EOA, Renishaw, SLM Solutions, Trumpf and XJET. BigRep will be unveiling two new machines today. 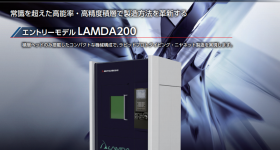 At the booth a technology termed “MXT” is described as “the new fast and precise extrusion technology”. More on this soon. New options for 3D printing in color are on display from Taiwan’s XYZPrinting with a significantly larger machine joining the da vinci color. Also, expanding into color is Boston’s Rize. 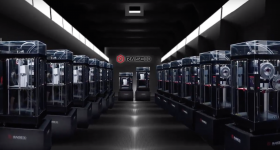 Joining the Rize One is a new machine called the xRize – a color FDM 3D printing system. The start-up area has 18 companies spanning the 3D printing ecosystem. From software by Authentise, material solutions from 3devo to the winners of this year’s Formnext startup challenge. In hall 4, TCT is hosting the TCT conference. Today’s program began with Peter Mischke from BMW discussing the journey from Prototyping to Production. Later today at 14:30 Dayton Horvath of NewCap Partners will present an update on how Startups, M&A and Business Strategies are shaping the additive manufacturing landscape.